Pete and I went to Atlantic City a few months after we started dating. We snapped a bunch of photos, which I compiled into a collage, and wrote "Lucky in Love" over it. I thought I was so clever. It's a good theme, lucky in love. It's cute and fun ad appeals to the gamblers in all of us. If you like to gamble too, you're in luck (ouch, that was a bad and unintentional pun). 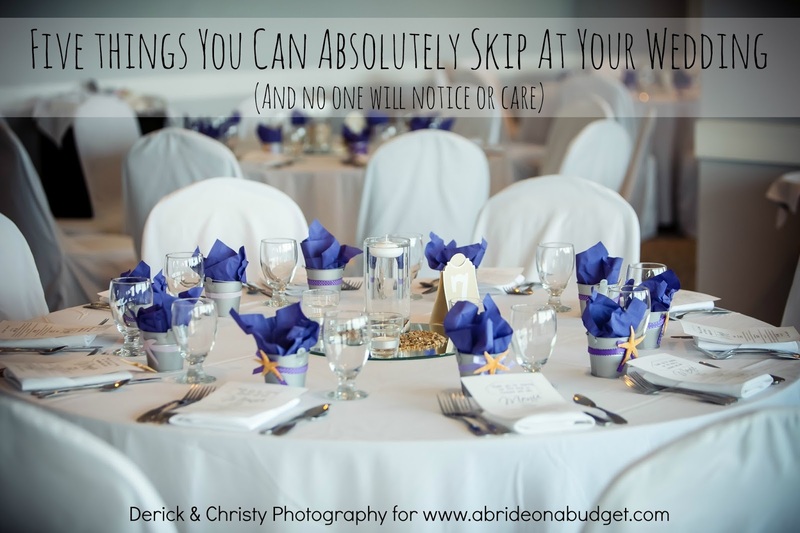 I put together a list of my favorite lucky in love wedding favors. 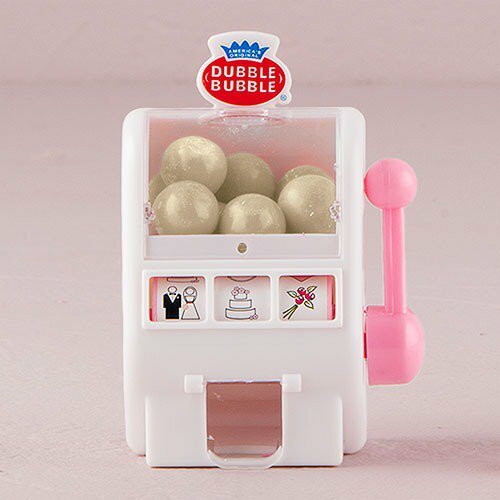 I'm in love with this Mini Gumball Slot Machine, so of course, it had to kick off the lucky in love wedding favors list. I remember having a similar toy when I was little. You pull the handle and the reels roll, just like a real slot machine. In this case, though, a gumball comes out. It actually comes filled with gumballs, so you don't have to worry about finding ones that fit. 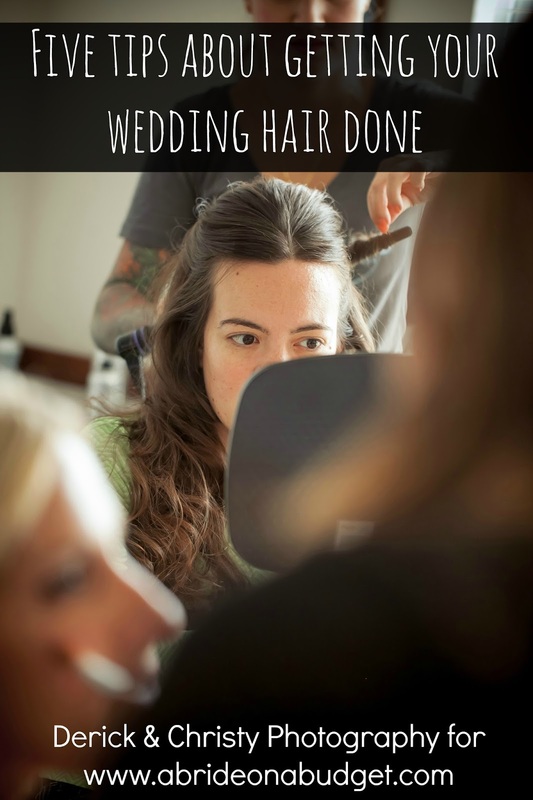 The images are all wedding-related too, which is fun. If you do like slots, you'll like these Jackpot Mini Stickers. They have a three of a kind on them (which is a great payout, in this case). You can have them personalized with your names and wedding date. They're 1-inch in diameter, which is a little large for Hershey's Kisses (if you want those labels, check them out here). These will fit better on a York Peppermint Patty or just on a plain cellophane treat bag. I love chocolate, so any sort of chocolate wedding favor is good in my books. Plus, I love card games (Let It Ride is my casino game of choice). 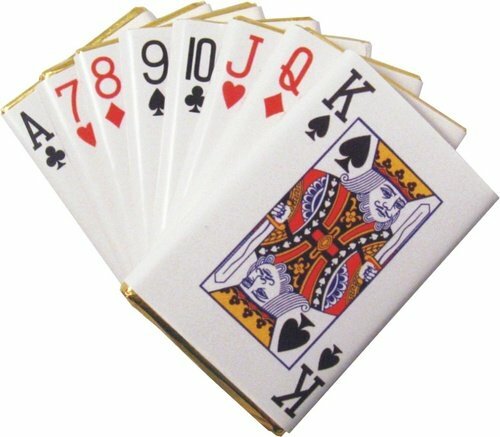 So Chocolate Playing Cards are an ideal lucky in love wedding favor if you ask me. These would look really nice at each place setting. We have a few wine bottle stopper wedding favors that we've accumulated over the years, and we use them all the time. It's so much easier than trying to re-cork a bottle of wine. 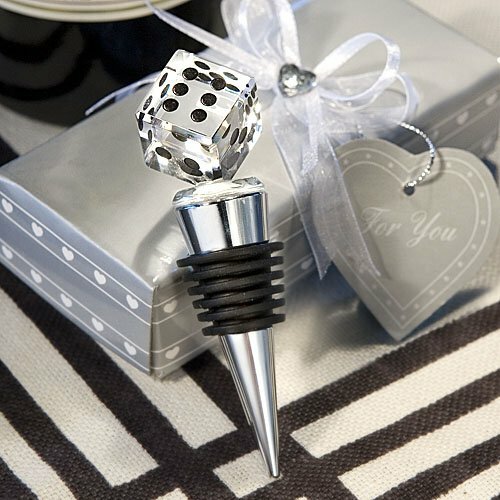 So your guests will really like this Die Wine Bottle Stopper. They'll use it often and think of your fun casino-themed wedding. Like dice, but you're not a fan of that die wine stopper? That's okay. Go with Chocolate Dice. You can give a pair to every wedding guest. They can share and an impromptu C-Low or Yahtzee game can break out. Plus, if you are inviting kids, this is actually a way to keep them entertained all night. 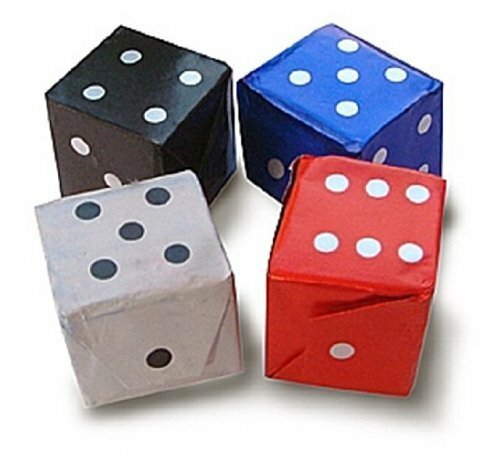 If you want to make it easy on yourself, pick up these Dice Favor Boxes. You can fill it with anything you want: candy, fresh air, whatever. It doesn't matter what color item is inside. Because the box is closed, it won't contrast with your wedding colors. I collect poker chips. I have a bunch from Atlantic City, Las Vegas, Cripple Creek (a hotbed of casinos in Colorado). 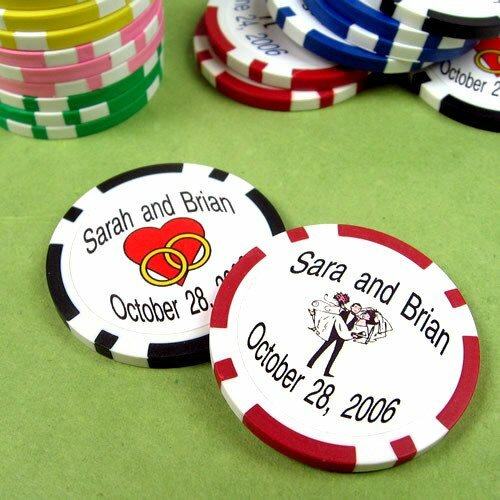 I don't have any personalized Wedding Poker Chips, though, so I just think these are so fun. Your names and wedding date are printed on a sticker that comes on these, so that's just really fun. My family plays cards at any get together. I mean, my brother even packed a deck and brought it to Japan. Plus, my grandma has a huge collection of playing cards from various casinos and tourist attractions. 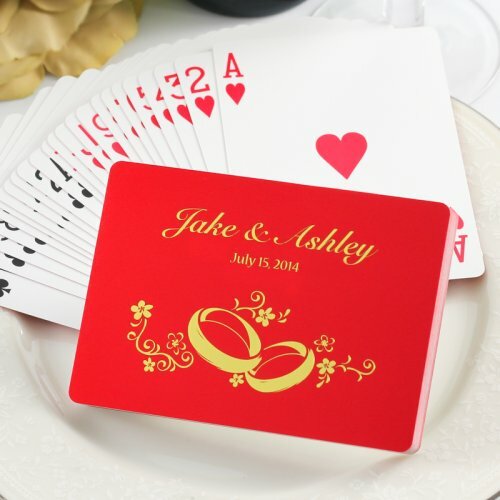 A lot of people are always digging for cards when they have company, so they will love Personalized Playing Cards as a wedding favor. I'm just ready to make them for my family's next get together. 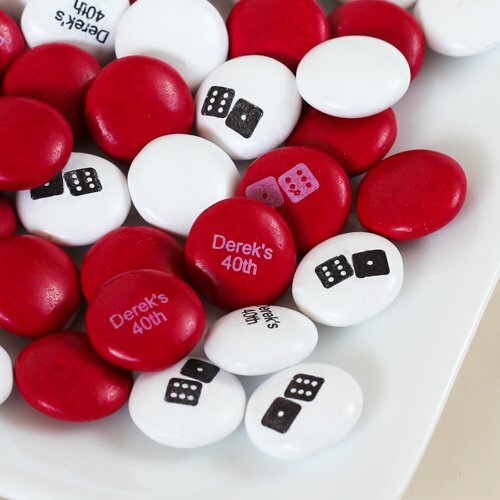 If you're looking for something easy and cute, plus in your wedding colors, check out these Personalized Chocolate Candies. 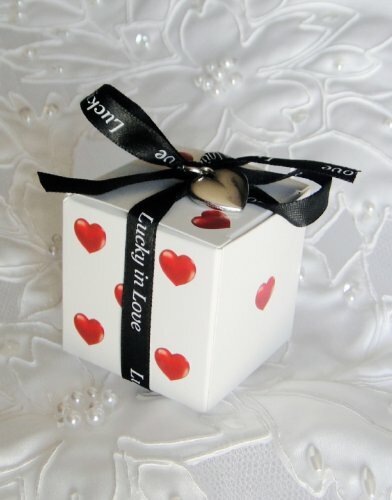 You can choose from a bunch of designs, but I suggest the dice for a lucky in love wedding favor. Then, add your names to a second color. I had a friend who gave these out as a wedding favor and everyone loved them. Something that's fun for gamblers and non-gamblers is scratch offs. 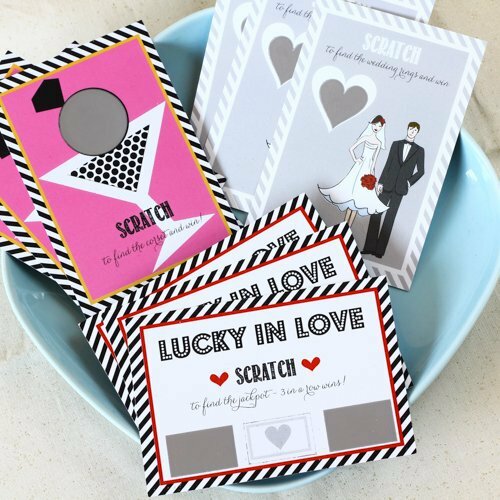 Add a little excitement with these Wedding Scratch Offs. 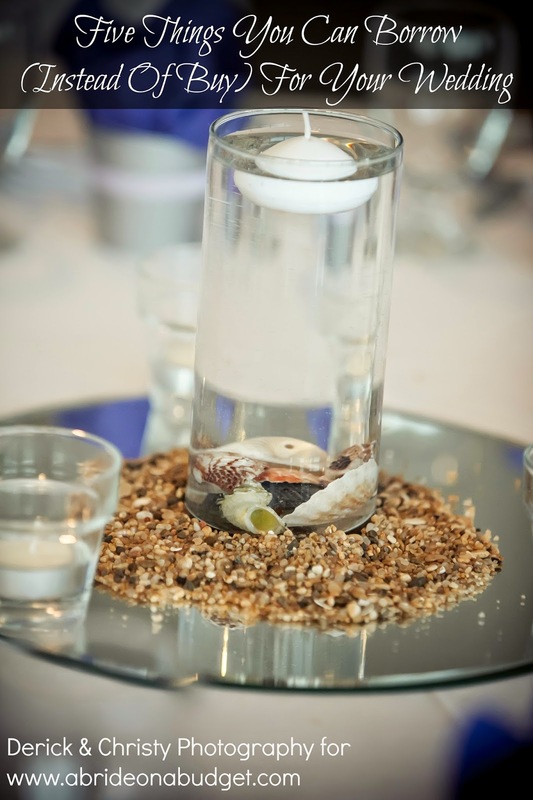 You can say the "winner" can take home the centerpiece. If you want something with a chance of winning money, you could always purchase actual scratch offs and leave those on everyone's plates. 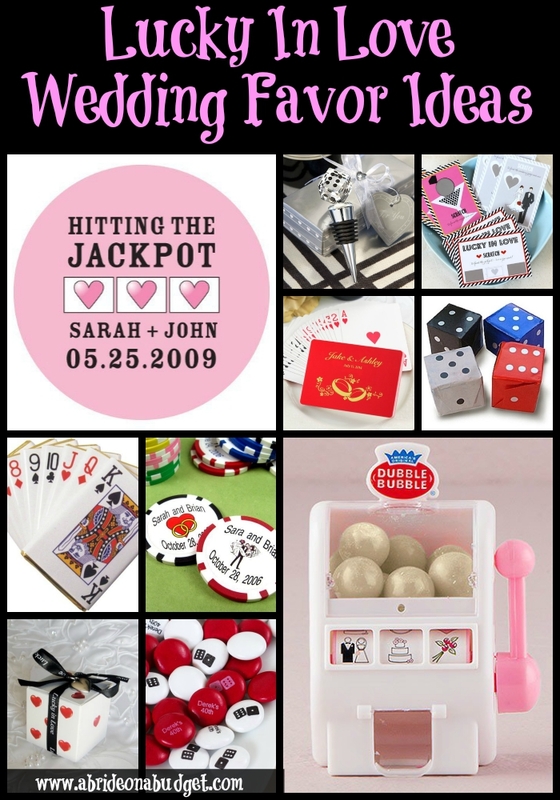 BRIDAL BABBLE: Which of these lucky in love wedding favors is your favorite? 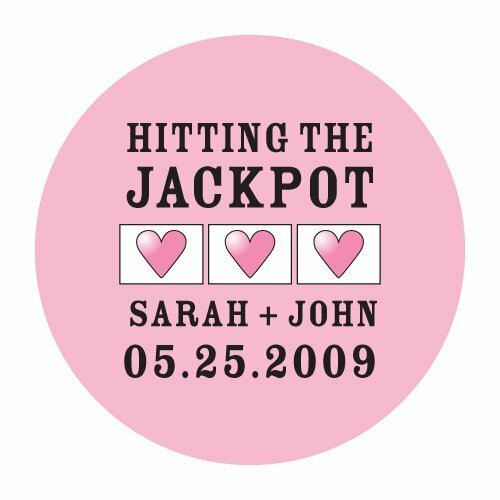 Planning a Lucky In Love themed wedding? 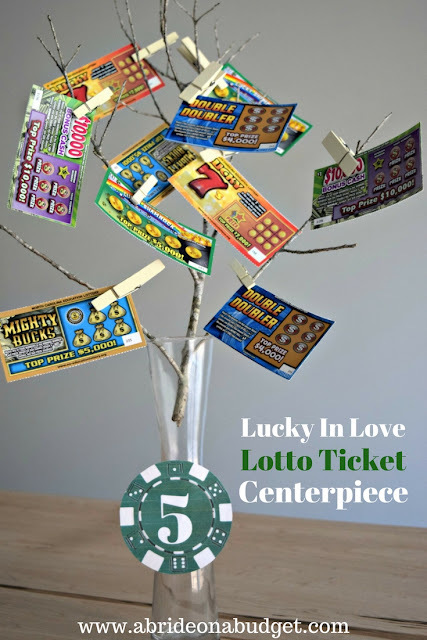 Check out our Lucky In Love Lotto Ticket Centerpiece. I love the first idea and also the last two, great ideas!!! Thanks! I love the first idea too. For the last, would you do those scratch offs or real ones? We almost got married in Vegas, but decided on something more traditional. However, the bubble gum slot machine or deck of cards would have been a cute wedding favor.